This study aimed at establishing occurrences of chest pains and frequent coughing among different classes of residents within Selebi Phikwe, Botswana where there are on going nickel-copper (Ni-Cu) mining and smelting activities. Through the administration of questionnaires and structured questions to 600 individuals, 7 health service providers, 200 business enterprises, and 30 educational institutions, attempts were made to establish and verify the existing human health status at Selebi Phikwe by focusing on chest pains and frequent coughing which are considered to be some of the respiratory tract related symptoms of sicknesses and diseases. 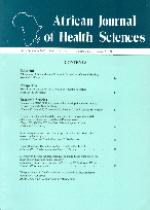 With the aid of statistical package for social sciences (SPSS), interpreted results from respondents indicated that 33% of the individuals complained of persistent chest pains; and 27% of educational institutions, 45% business enterprises, and all health service providers had learners, workers, and patients who complained of chest pains. Furthermore, 49% of the individuals complained of persistent frequent coughing; and 70% of educational institutions, 45% business enterprises, and all health service providers had learners, workers, and patients who complained of frequent coughing. According to study sites, respondents living in sites closest to the mine and smelter/concentrator plant reported a higher incidence of chest pains and frequent coughing, compared to those living in other parts of the study area. Residents associate fumes and dust from mining activities to the frequent coughing and persistent chest pains, which could be symptoms of respiratory tract diseases. This baseline investigation calls for further studies to establish relations of mining activities to human health at Selebi Phikwe. Selebi Phikwe township, which grew out of nickel-copper (Ni–Cu) mining activities is located in the north-eastern part of Botswana between longitudes 27o 47'E and 27o 53'E, and latitudes 22o 55'S and 22o 00'S. The study area of approximately 250 km2 has a population of about 50,000 with a 2.4% constant growth rate since 1991 . Rapid population expansion from < 5,000 in 1971 to the present population size characterised by 52.5 % male and 47.5 % female, has led to pressure on existing social and economic infrastructures , including the health status of its inhabitants. Previous studies carried out by Ekosse  and Ekosse et al. [4, 5, 6, 7] demonstrated trends of contamination of the biophysical environment due to Ni-Cu exploitation. It is suspected that human health problems may have ensued within Selebi Phikwe due to mining activities . Residents of the area generally complain of being often infected with symptoms of diseases and sicknesses, and particularly those related to the human respiratory tract health complications , especially chest pains and coughs. This work thus presents a survey which was undertaken to appraise the extent to which residents of a Ni-Cu mining and smelting environment suffer from chest pains and coughs. The study attempted to establish and verify the existing occurrences of chest pains and coughs affecting residents at Selebi Phikwe; in an endeavour of understanding any implications due to the Ni-Cu mining activities. The study area was divided into 10 sampling sites which included a chosen control site which is 56 km from Selebi Phikwe and is located close to the road junction leading to Selebi Phikwe from the Gaborone-Francistown main road. Figure 1 shows the study area with the different sites where the interviews and tests were conducted. Questionnaires on human health status of the residents related to chest pains and coughs were prepared for individuals, educational institutions, business enterprises, and health service providers (Table 1). The questions asked reflected on regular coughing, types of coughing, times and duration of coughing, chest pains, and chest pains being accompanied by regular coughing. Individuals, headmasters of educational institutions, directors of business enterprises, and health service providers and/or delegated officials responded to the questions. Statistical analyses for responses obtained from the administered questionnaires were performed using the Statistical Package for Social Sciences (SPSS) . Cross tabulations were undertaken to verify existing relationships of study sites to chest pains and frequent coughing of the residents. Values for complaints of chest pains were generally low except for the respondents at health service providers; these all reported that they had patients who complained of chest pains. As shown in Table 2, values < 50% for chest pain were obtained from individuals (33%), educational institutions (27%), and enterprises (40%). However, when considering the responses according to study sites, in site five the values were > 50% for all the categories of persons. Notably, 100% was recorded for educational institutions in sites three and five, and for all the health service providers. Regarding industries, sites one and nine registered values > 50 % (Table 2). Percentage values for respondents from the different study sites in the Selebi Phikwe area experiencing chest pains, ranged from 5% for females in site two to 54% for females in site five (Figure 2). The incidence of chest pains and the smelter/concentrator plant (sites four, experienced by males was higher than that of five and six) reported a higher incidence of chest females at all the sites except for site five. pains. This was true for most of the respondents Respondents living in sites closest to the mine of both the mine and plant. The numbers of individuals experiencing chest pains at night as well as all day were significantly higher than those experiencing the pains at certain times during the day. Most of the respondents were not sure of the frequency with which they experienced chest pain. However, more respondents reported experiencing chest pains on a weekly basis than those who suffered on a monthly basis. 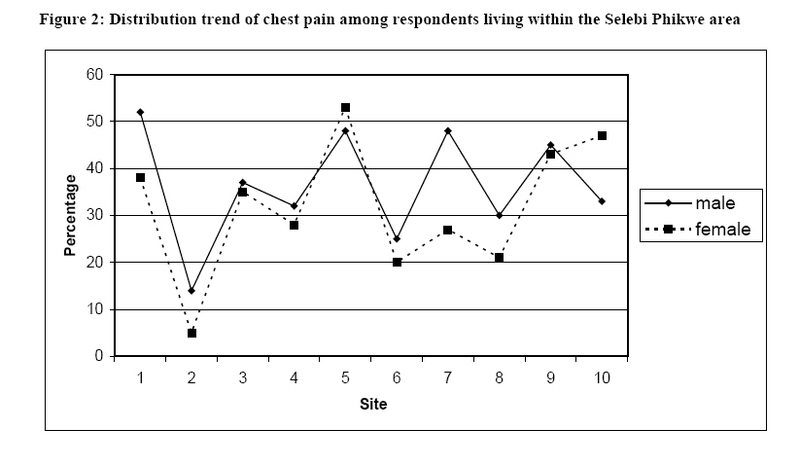 Table 3 indicates the severity of chest pains experienced by individuals living within the Selebi Phikwe area. Some of the respondents living close to the mine and smelter/concentrator plant complained of moderate to acute, and at times both moderate and acute chest pains. A few of the respondents complained that they experienced mild chest pains, whereas a few others were not sure whether the chest pains they experienced were mild, moderate or severe. According to the responses from headmasters/designated officials, learners who complained of having chest pains were in sites one to seven. However, the < 20% of pupils/students who suffered from chest pains were from sites two, three and six, whereas the 30 – 40% of them were from sites one and five. Only in sites three and five did some learners complain of having moderate chest pains, while at sites two, three and four, they indicated having acute chest pains. In site one, 20% of the commercial enterprises found that 81-90% of their workers complained of having acute chest pains, while 80% of the commercial enterprises had a varied number of workers who complained of having acute chest pains. In site two, 89% of the enterprises indicated that a varied number of workers complained of experiencing acute chest pains. Furthermore, all the commercial enterprises in site four indicated that 41-50% of their workers complained of having acute chest pains. In site three, all the responses from the food/health enterprises indicated that 91-100% of their workers complained of acute chest pains. In the study sites reflecting the different unspecified enterprises, the responses signaled an indeterminate number of workers with acute chest pains. Regarding workers of enterprises having dull chest pains, all the respondents from the industries in the Selebi Phikwe area indicated that the workers were not sure of whether they had dull chest pains. However, some of the workers complained of moderate chest pains. All the food/hotel enterprises in site nine found that 31-40% of their workers complained of moderate pains. In site nine, all the liquor store enterprises had 71-80% of their workers who complained of moderate chest pains. Respondents living in sites closest to the mine and the smelter/concentrator plant (sites four, five and six) reported a higher incidence of chest pains. This was true for most of the respondents of both the mine and plant. 49% of the individual respondents indicated that they suffered from frequent coughing. All of the health service providers, 70% of the educational institutions and 45 % of business enterprises reported that they had patients, learners and workers respectively who complained of persistent coughing. As shown in Table 4, values < 50% for residents who complained of frequent coughing were obtained from individuals (49%), and respondents at enterprises (45%). 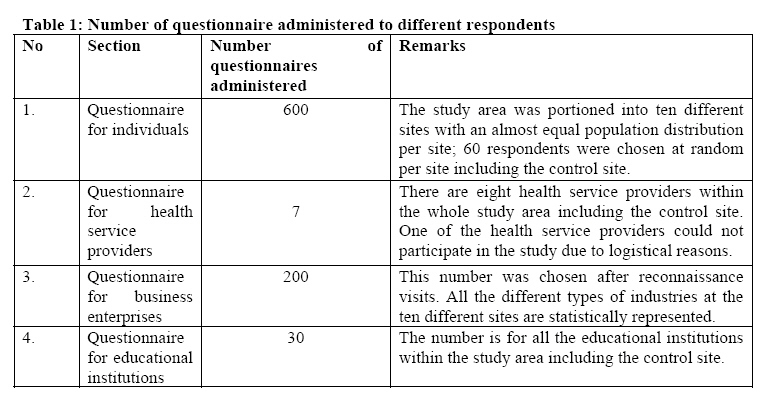 Considering the responses according to study sites, very high values were obtained for individuals, educational institutions, and health service providers in sites four, five, six, seven and nine as depicted in Table 4. More males than females suffered from repeated coughing bouts in the Selebi Phikwe area, with the highest percentage being 81% for males in site one (Figure 3). In sites three and eight the male population suffering from repeated coughing bouts was lower than that of the females. Almost equal percentages were observed for both males and females at sites five, seven and nine. Sites three, four, five, six, seven and nine had values of respondents experiencing coughing (between 50% and 70%) higher than that of the control site (37%). 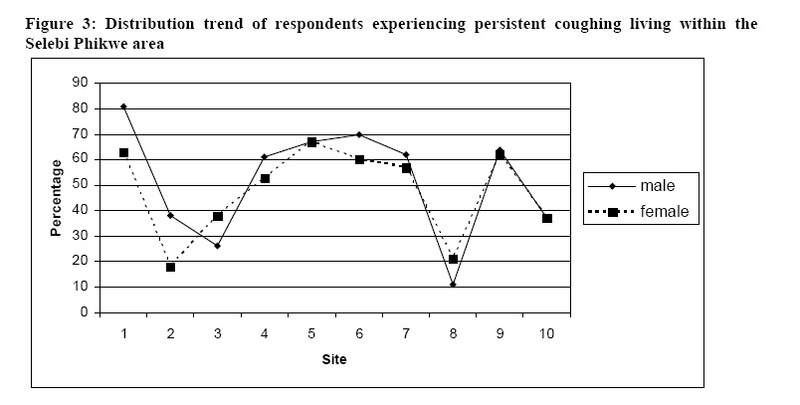 Most of the respondents were not really sure of the frequency with which they experienced coughing bouts (Table 5). However, a substantial percentage of the respondents often experienced coughing every day. The remaining fraction of respondents reported that they experienced coughing once a day, once a week or once a month. The percentage values of respondents in Selebi Phikwe who suffered from coughing at night were conspicuously higher than those who suffered from it throughout the day, as could be seen in Table 6. Some respondents suffered from coughing in the mornings whereas others suffered in the afternoon. Table 7 gives the percentage of learners attending school in Selebi Phikwe who complained of often coughing. In the class of< 20% of the students attending school in the Selebi Phikwe area who suffered from repeated coughing, 100% were in site three, 33% each from sites two, six and seven, 40% from site four, and 50% from site nine. 21–30% of the learners who suffered from repeated coughing were distributed among the following sites: 33% each from sites two, six and seven, 20% from site four, and 50% from site nine. 33% each from sites two and seven were of the class of 30– 40% of learners who suffered from coughing. All of those who suffered from repeated coughing in site eight were from the class of 40– 50% as well as 33% of those in site six. According to the responses from the headmasters/designated officials most of the learners who suffered from regular coughing were not sure whether the type of cough they had was dry or wet. However, most of those in sites three, four, five and six indicated having a dry cough, whereas a few in sites three, four and five acknowledged their cough to be wet. 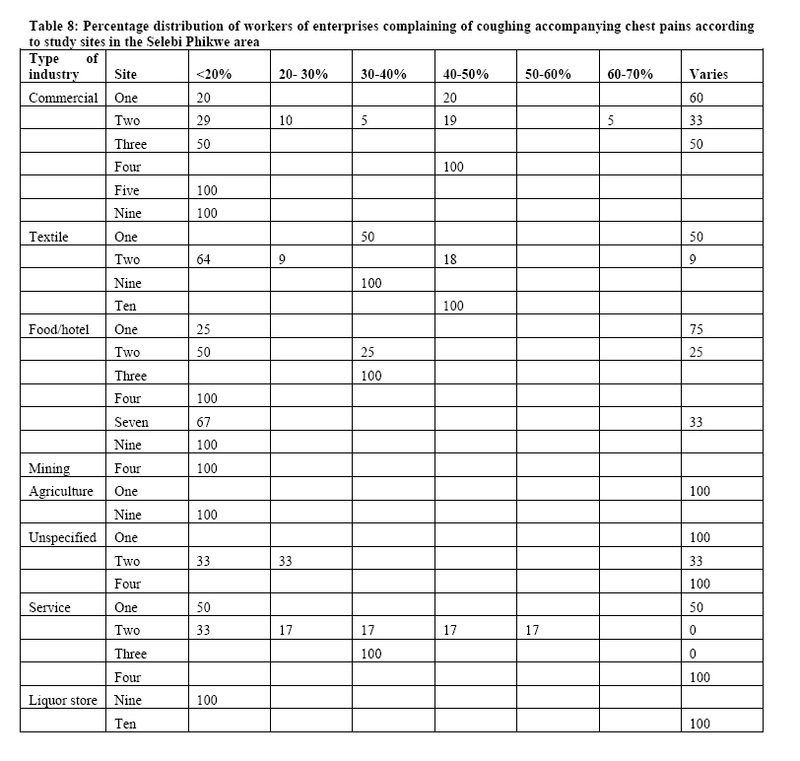 Table 8 depicts the trend pattern of enterprises showing the percentage distribution of workers suffering from coughing accompanying chest pains according to the study sites. As indicated in Table 8, all the commercial enterprises in site four which responded to the questionnaires indicated that 40–50 % of their workers complained of regular coughing as well as of experiencing chest pains. All the commercial enterprises in site five indicated that 20–30% of their workers had the same symptoms, whereas in site nine, all the commercial enterprises which responded to the questionnaires indicated that < 20% of their workers complained of coughing regularly as well as experiencing chest pains. All the textile enterprises in sites nine and ten had 30–40% and 40–50% of their workers respectively who complained of coughing often as well as of experiencing chest pains. All the mining enterprises in site four indicated that 20-30% of the workers complained of coughing regularly as well as experiencing chest pains and all the commercial enterprises in site four indicated that 40-50% of their workers had similar complaints (Table 8). Similarly, all the commercial enterprises in site five indicated that 20-30% of their workers had the same symptoms, whereas in site nine, all the commercial enterprises that responded to the questionnaires indicated that < 20% of their workers complained of coughing regularly as well and of experiencing chest pains. All the textile businesses/industries in sites nine and ten had 30-40% and 40-50% of their workers complaining of coughing often as well as of experiencing chest pains. 86% of health service providers reported that they had patients who complained of coughing and chest pain. All of the health service providers mentioned that they had patients who complained of dull, moderate and acute headaches but they were not sure of the different percentages. Similarly, all the health service providers reported that some of their patients complained of dull, moderate and acute chest pain, but again were not able to provide percentages. At all the health facilities, patients who visited these facilities complained about dry and wet coughs as well as coughing with sputum and coughing with chest pains. 14% of those patients who suffered from all of these ailments were from site ten. More males in sites one, three, five, seven and nine complained of persistent chest pains than those at the control site. However, females at site five only, complained more of chest pains than those at the control site. It was nevertheless generally observed that within the study area there were widespread complaints of chest pains. Inhabitants of Selebi Phikwe could attribute complaints of chest pains to the inhalation of sulphur rich gases. Chest pains have been related to breathing of gaseous fumes by the people living in Selebi Phikwe . The particulate air matter (PAM) including some of the gases, such as SO2 and to a lesser extent H2S have a choking effect on human beings, affecting their respiratory system and causing them to have chest pains . In this regard, it may be assumed that the mining and roasting of Ni-Cu rich ore bodies could have provoked the persistent chest pains experienced by individuals living in Selebi Phikwe. Respondents who experienced chest pains also indicated suffering from frequent bouts of coughing. Respondents further indicated that some of the main causes of the coughing troubling them included fumes from the mine and smelter/concentrator, dust, weather and smoking of cigarettes. Furthermore most of the respondents coughed frequently at night because particles trapped during the day remain in the houses where night ventilation is poor as a result of closed doors and windows. Obviously, there are many different causes of chest pains. The most common causes are angina at rest and heart attack, although other causes include occlusion, pulmonary embolism and pneumothorax . 27% of learners in Selebi Phikwe area complained of having chest pain. 40% of the workers complained of chest pain. Moreover, all the health service providers indicated that they had patients who complained of chest pains. Asare  related complaints of chest pains to breathing of gaseous fumes by the people living in the Selebi Phikwe area. Some of the gases such as SO2, and to a lesser extent H2S, have a choking effect in human beings and affect their respiratory systems causing them to have chest pains . In this regard, it may be assumed that the mining and roasting of Ni-Cu rich ore bodies could have provoked chest pains experienced by individuals living in Selebi Phikwe. At the control site, however, a greater number of the respondents indicated that the cause of their coughing was more likely due to cigarette smoke than dust. The coughing experienced by respondents in areas one to nine was probably provoked by environmental conditions such as gases from mining and smelting activities, and climatic factors like the changing of seasons. During the winter season, it becomes very dry and windy in Selebi Phikwe, causing a large number of dust particles to be suspended in the air for longer periods. Residents of such environments inhale these particles, and eventually suffer from respiratory tract illnesses and diseases [12,13,14]. More males than females complained of persistent coughing in the Selebi Phikwe area. Respondents indicated that some of the main causes of their coughing included fumes from the mine and smelter/concentrator, dust, weather and smoking of cigarettes. 70% of the educational institutions indicated that they had pupils who complained of coughing regularly, and 45% of the business enterprises mentioned that their workers complained of frequent coughing. Furthermore, all of the health service providers responded that their patients complained of coughing regularly. In a study conducted by Pope et al. [12,15] it was observed that there were increased hospital admissions because of respiratory problems, and increased emergency room visits to hospitals due to respiratory problems caused by pollution resulting from PAM, SO2 and toxic fumes in the Utah Valley, USA. Pope et al. further observed that residents in the affected area had experienced an increase in asthmatic attacks, bronchodilator use, emergency visits and hospital admissions. Moreover, they experienced increased lower respiratory tract symptoms and coughing, significant decrease in lung function, and increased number of days of work or school missed. Although these observations by Pope et al. [12,13,15] cannot be presently substantiated from this study, the high percentage of individuals tested who complained of coughing regularly could be attributed to the presence of pollutants resulting from the mining and smelting activities at Selebi Phikwe. This investigation that was conducted through the administration of questionnaires focussed on trends of chest pains and frequent coughing of residents at the Selebi Phikwe Ni-Cu mine area, Botswana. Findings depicted that individual learner’s of educational institutions, workers of business industries, and patients visiting health services generally complain of persistent and acute chest pains and frequent coughing. The males living in sites one, seven and nine, and the females of site five recorded higher incidences of chest pains than those living at the control site. In a similar manner, both males and females of sites one, four, five, six, seven and nine, had higher percentages of complaints of frequent coughing than those at the control site. Persistent chest pains and frequent coughing could be symptoms associated with respiratory tract diseases that could ultimately lead to COPD or even lung cancer [16,17,18]. Frequent, persistent and acute chest pains, and frequent coughing have been diagnosed as precursors of asthma, lung cancer, high blood pressure and chronic bronchitis. At Selebi Phikwe individuals, respondents of educational institutions, business enterprises, and health service providers had complained of these symptoms and cases of deaths had been reported as a result. While there may be several causes of the persistent chest pains and frequent coughing, at Selebi Phikwe PAM and gaseous fumes could be very contributory. Asare B. Perceptions on socio- economic and environmental impacts of mining in Botswana: A case study of the Selebi Phikwe Cu-Ni mine. Unpublished MSc thesis, University of Botswana, Gaborone, Botswana. 1999; p126. Australian Lung Foundation. COPD – Chronic bronchitis and emphysema. Australian Lung Foundation Lung Net. Available online: http://www.lungnet.org.au. Accessed 14 August 2003. Botswana Government National Census. National population and housing census report. Government Printer. Gaborone, Botswana. 1991. Department of Town and Regional Planning. 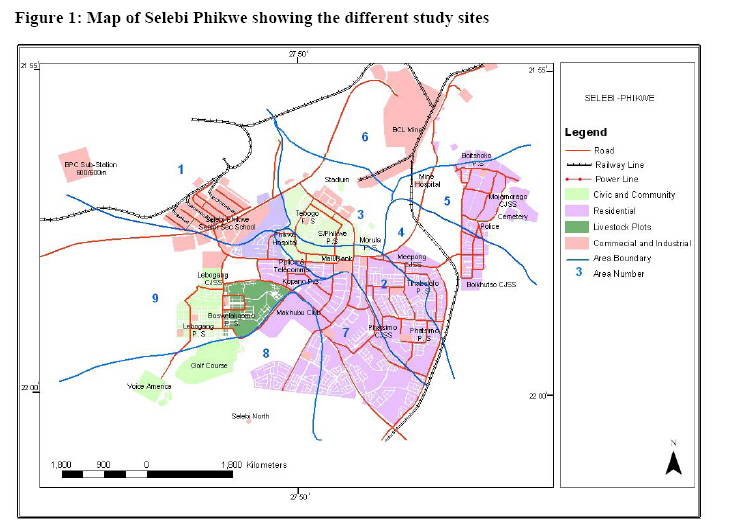 Selebi Phikwe Development Plan: 1996 – 2016. Selebi Phikwe Town Council, Botswana. 1996; p55. Ekosse G. Heavy metals concentrations in the biophysical environment around the Ni-Cu mine and smelter/concentrator plant, Botswana. Global Journal of Environmental Science (in press) 2004. Ekosse G; Van den Heever DJ; De Jager L. and Totolo O. Environmental mineralogy of soils around Selebi Phikwe nickel-copper plant, Botswana. International Journal of Environmental Studies.2003; 60:251-262. Ekosse G; Van den Heever DJ; De Jager L. and Totolo O. Environmental chemistry and mineralogy of particulate air matter around Selebi Phikwe nickel-copper plant, Botswana. International Journal of Minerals Engineering 2004;17:349-353. Ekosse G; Van den Heever DJ; De Jager L. and Totolo O. Mineralogy of tailings dump around Selebi Phikwe nickel-copper plant, Botswana. Journal of Applied Sciences & Environmental Management. 2004; 8:37-44. National Heart, Lung and Blood Institute. The lungs in health and disease. National Heart, Lung and Blood Institute Division of Lung Diseases, Office of Prevention, Education and Control. USA. 2003; p39. Pope CA; Dockery	DW and Shwartz J. Review of epidemiological evidence of health effects of particulate air pollution. Inhalation Toxicology. 1995; 7. Pope CA III; Dockery DW; Kanner RE; Vollegas GM and Schwartz J. Oxygen saturation, pulse rate, and particulate air pollution: a daily time-series panel study. American Journal of Respiratory and Critical Care Medicine.1999; 159:365-372. Pope CA III; Verrier RL; Lovett EG; Larson AC; Raizenne ME; Kanner RE; Schwartz J; Villegas GM; Gold DR and Dockery DW. Heart rate variability associated with particulate air pollution. American Heart Journal. 1999; 138:890-899. Statistical package for Social Sciences Version Statistical package for Social Sciences, SPSS Version 11.2. 2003. The Human Respiratory System Diseases of the lungs. Available online http://users.rcn.com/jkmball.ma.ultranet/Bio logyPages/P/Pulmonary. Accessed 29 January 2003.